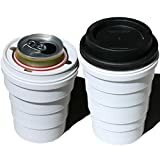 When you want to be extra discreet about your public beer drinking, then simply attach this cool new Trinken Lid to the can's rim and slip it into a large paper coffee cup, like those used in most popular coffee shops. Voila! Now you're drinking... Coffee? Tea? 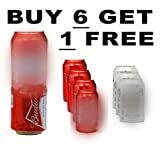 Obviously, not beer. 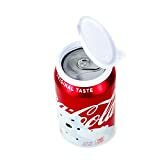 Once securely snapped on tight, this innovative lid not only keeps your beer camouflaged, it also helps keep it cold by insulating it inside the cup with a layer of air. 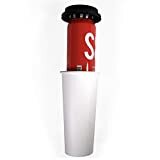 It also features an ergonomically designed rim and spout, a secondary air hole to keep your beer flowing smoothly, and a silicone gasket seal to prevent links. 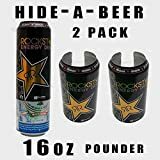 Perfect for enjoying an ice cold beer while walking the dog, shopping at the store, being bored at the office, sitting on the beach, riding on a train, listening intently at parent / teacher conferences, or just strolling about here or there or anywhere with a mighty thirst.